Protesters run during a massive anti-government protest in Kabul, Afghanistan, May 16, 2016. Tens of thousands of ethnic minority Hazaras, protesting the rerouting of a power line, were blocked in their attempt to march to the presidential palace in Kabul Monday. Authorities, fearing violence, set up shipping containers overnight, effectively closing off Kabul's commercial center to foot and motor traffic. Leaders of Monday's demonstration have called the routing of the line through the mountainous Salang pass north of Kabul and away from their territory in Bamiyan evidence of enduring bias against the Hazara. The Hazara, considered the poorest of the country's minority groups, account for about 15 percent of Afghanistans 30 million population. The 500-kilovolt power line is seen as a crucial infrastructure project. The transmission line, intended to provide secure power to 10 provinces by 2018, is part of the wider TUTAP project backed by the Asian Development Bank to link the energy-rich Central Asia republics of Turkmenistan, Uzbekistan and Tajikistan with Afghanistan and Pakistan. Only about 30 percent of Afghanistan is connected to electricity. The current power system has frequent blackouts. Kabul said the route through the pass would be shorter, speeding up the project and saving millions of dollars. Some protesters threw stones at officials and banged on sides of the shipping containers, but the protest Monday ended quietly. "(President) Ashraf Ghani is hiding himself behind blast walls," Dawood Naji, a Hazara leader, told flag-waving demonstrators, drawing rousing applause. "We can break down these containers if we want but we are here to protest in a civilised way for our rights." Ghani is a Pashtun, which is the largest ethnic group in Afghanistan. He appointed a team to study the viability of rerouting the line through Bamiyan and suspended work on the project until the commission reported its findings later this month, his office said in a statement. 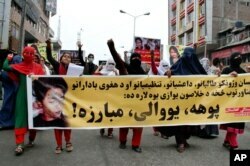 FILE - Women march as they hold photos showing ethnic Hazara victims who were allegedly beheaded by the Taliban, in Jalalabad, east of Kabul, Nov. 12, 2015. The U.S. Embassy in Kabul closed its consular section and warned Americans to limit their movement within Kabul. “Even demonstrations intended to be peaceful can turn confrontational and escalate into violence,” it said in an emergency message. Monday's protest followed a rally in November against the murder of a group of Hazara people that became the biggest anti-government demonstration in Kabul for years. During those demonstrations, protesters tried to scale the walls of the presidential palace.